water supply of the area to be dewatered is high. Deep wells are filter wells constructed with gravel filter body of a diameter between 600 and 1400 mm, their diameter is between 400 and 600 mm, equipped with a filter surface of an appropriate length. 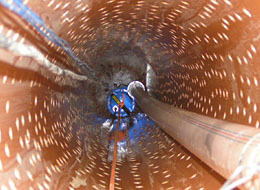 The distance between them is generally 5-25 m. Heavy duty pumps equipped with level control automatics are installed in the wells, connected to an evacuating collector system. 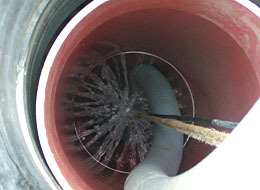 In the adjacent wells, the uppermost point of the depression cone formed due to the dewatering activity is the maximum level of the drained groundwater. 2008 - PORR Építési Kft. 2009 - BAZALT-KÖZÉPKŐ Kőbányák Kft.